Ascariasis (as-kah-RI-ah-sis) is an infection of the intestines by parasitic roundworms that usually causes no symptoms but is sometimes serious. The world is full of roundworms. Hundreds of thousands of different kinds inhabit the Earth, and a few types inhabit the bodies of humans, as well. The most common of these is a worm called Ascaris (full name Ascaris lumbricoides), which is estimated to infect 1 billion people worldwide. Ascariasis, which is what the infection or infestation is called, usually occurs in tropical and subtropical areas where sanitation is poor and where raw or improperly treated human sewage is used to irrigate or fertilize crops. Most cases occur in Africa and Asia, but it has been estimated that 4 million people in the United States carry Ascaris (AS-ka-ris), most of them in rural southeastern areas. * parasites are creatures that live in and feed on the bodies of other organisms. The animal or plant harboring the parasite is called its host. The roundworm Ascaris lumbricoides is the largest of the human intestinal parasites. Sinclair Stammers/Science Photo Library, Photo Researchers, Inc.
Ascariasis infections begin when people swallow worm eggs that they have picked up from infected food or from soil. When the eggs hatch in the small intestine, they become larvae and swim through the bloodstream to the lungs, and then on to the throat, where they are swallowed. Back in the stomach and small intestine, the larvae become adults, mate, and produce new eggs. The entire cycle, from eggs being swallowed to new eggs being produced, takes about 2 to 3 months. parasites, it infects only humans. 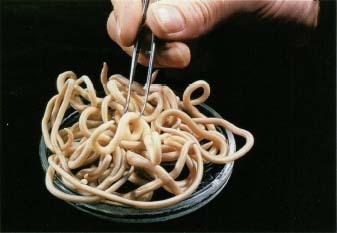 Although Ascaris worms are found in people of all ages, children are most likely to be heavily infected. What Is the Life Cycle of the Ascaris Worm? Adult Ascaris worms live in the upper portion of the small intestine. They are 20 to 40 cm (8 to 15 inches) long, 3 to 6 mm (1/8 to 1/4 inch) in diameter, and live for about 1 year. Fertilized females produce up to 240,000 microscopic eggs a day, which pass out of an infected person's body in the stool. 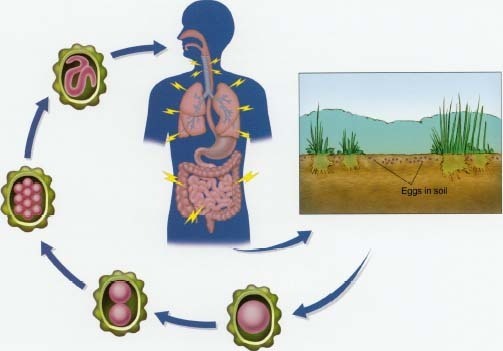 Fertilized eggs must remain in the soil for 2 to 3 weeks before they can infect another person. The eggs, however, can remain alive and viable * in soil for years. Infection usually begins when soil containing eggs gets on people's hands. If they eat or touch their mouths before washing their hands, the eggs can get into their mouths and be swallowed. The eggs may also get into the body in food that has been contaminated with human waste. * viable means an organism can survive, grow, develop, and function. * pulmonary is the adjective that refers to the lungs. The eggs hatch in the small intestine and release free-swimming larvae. The larvae penetrate the wall of the small intestine and enter the blood-stream. Next comes the pulmonary * stage of the infection, when the larvae enter the lungs and move up the bronchial tubes, which are the passages that carry air to and from the lungs. They finally reach the pharynx (FAR-inks), the back of the throat, where they are swallowed. Then they move through the stomach and back to the small intestine where they were hatched. In the small intestine, they become adults and mate, and the females begin producing eggs. The entire cycle, from eggs being swallowed to new eggs being produced, takes 2 to 3 months. What Are the Symptoms of Ascariasis? Ascariais usually causes no symptoms. In heavy infections, however, abdominal cramps occur, and occasionally a mass of worms can block the intestines, causing pain, vomiting, and bloating. Adult worms also can block other parts of the digestive tract, such as the appendix, bile duct, or pancreatic duct, causing similar symptoms. When the larvae are migrating through the lungs, they may cause a fever, dry cough, wheezing, and sometimes asthma. How Is Ascariasis Diagnosed and Treated? Since Ascaris produces such an abundance of eggs, they often can be seen when stool samples are examined under a microscope. Less commonly, an adult worm may be passed in the stool or may crawl up the throat and try to exit through the mouth or nose. Ascaris larvae may be identified in sputum or phlegm coughed up during the pulmonary stage. Doctors may prescribe several different oral medications to treat ascariasis. If the intestine is blocked, surgery may be necessary. If the pulmonary stage is severe, corticosteroids may be prescribed to lessen the symptoms. How Can Ascariasis Be Prevented? Thoroughly washing fruits and vegetables in clean water, washing hands before eating or preparing food, and washing hands after using the bath-room are advised. Improved sanitation and hygiene in developing countries would cut the risk of infection in thlose areas. Coupled with such improvements, routine or preventive treatment with deworming drugs, called anthelmintic (ant-hel-MIN-tik) medications, could reduce the prevalence of ascariasis worldwide. About 1 billion people worldwide are infected with Ascarisworms. An adult Ascaris worm is 20 to 40 cm long. A female Ascaris worm can produce 240,000 eggs a day. The U.S. Food and Drug Administration's Center for Food Safety and Applied Nutrition posts a Bad Bug Book on its website with information about Ascaris lumbricoides and other parasitic worms. The U.S. National Center for Infectious Diseases (NCID) has a Division of Parasitic Diseases (DPD) website that offers information about ascariasis and its geographic distribution.